The shortstop position for the Cincinnati Reds is one with a big question mark. After years of having Zack Cozart man the position, including a huge 2017 season, the organization is looking for the next guy. For 2018 it appears that they are going to look at Jose Peraza – at least in the beginning of the year. In his two seasons with the Reds, we have seen two extremes. In 2016 he hit .324/.352/.411 and stole 21 bases in about half of a season. Last season saw Peraza struggle, hitting .259/.297/.324 with 23 steals. And on top of the struggles at the plate, he also only played 422 innings at shortstop. Between the two years, according to UZR, he’s a slightly below-average defender. Of course, the sample size there is small, so the error bars in that value could be large. In Triple-A last season it was Zach Vincej for 106 games at shortstop. No one else spent more than 15 games at the position. The Reds, however, lost Vincej on waivers after the season to the Seattle Mariners. He was then waived by the Mariners, went unclaimed and was outrighted to Triple-A. Blake Trahan saw almost all of the time at shortstop for Pensacola. He played 135 games at the position for the Blue Wahoos. In the field he was very sure handed, making just nine errors on the season. That led to a .982 fielding percentage. At the plate it was more of a struggle for Trahan. At the plate he hit just .222/.311/.275 in 526 plate appearances. There’s not much power there, with just 20 extra-base hits on the season. Where he did find success was his plate approach – he walked 52 times and had just 82 strikeouts. If he’s going to compete for a job as a starter in the big leagues he’s going to have to hit better moving forward. Daytona saw another guy take almost all of the playing time at shortstop. Alfredo Rodriguez played in 115 games, with no one else playing in more than 11 games. It was his first full season as a professional in America. Defensively he showed off all of the tools you want to see from an outstanding defender. He made 16 errors and posted a .967 fielding percentage. Like Trahan above him, Rodriguez struggled at the plate. The Cuban born shortstop hit just .253/.294/.294. There wasn’t much power, Rodriguez had just 16 extra-base hits. Unlike Trahan, he didn’t walk much, drawing just 25 walks on the year. He did, however, make plenty of contact with just 79 strikeouts on the year. He’s the best defender in the organization at shortstop, but his bat is going to have to improve substantially moving forward if he’s going to have a chance to be a starter at the next level. 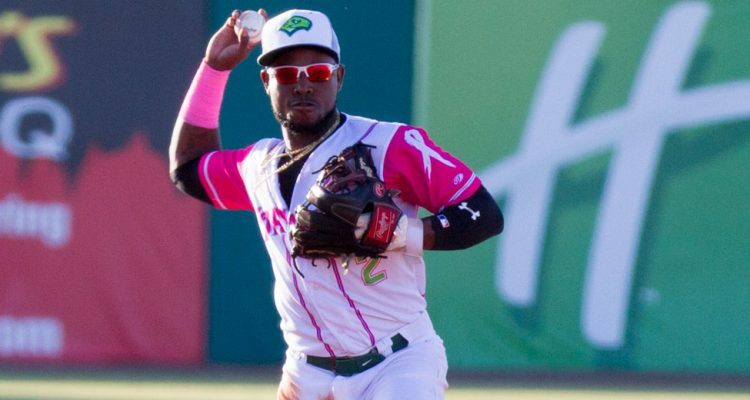 For the Dayton Dragons there were a few guys who shared some of the shortstop responsibilities. Hector Vargas played in 87 games, getting the biggest chunk of time at the position. The 22-year-old made 20 errors and posted a .939 fielding percentage. His errors were split 9-to-11 between throwing and fielding. At the plate he struggled, hitting .225/.260/.309. He’s got a quick bat, and his power potential is more than he showed with 14 doubles, a triple and seven home runs. He makes contact, with just 66 strikeouts in 121 games. But, he didn’t walk much – he had just 19 walks during the year. Like the guys above him in the organization, the bat will have to take a step forward if he’s going to compete for a starting gig down the line. 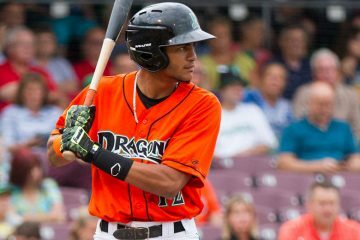 Carlos Rivero played in 38 games at shortstop in the second half of the season for the Dragons. He was strong defensively, but he struggled at the plate. In 145 plate appearances he hit just .180/.273/.230. In Billings he made another 13 starts at shortstop and did hit a little better there with a .564 OPS. Jeter Downs saw a majority of the time at shortstop for Billings. The 1st round pick struggled on the defensive side of things. He made 15 fielding errors to go along with three throwing errors in 50 games played. That led to a .911 fielding percentage. He will have to improve in this aspect moving forward, but scouts seem to believe he can do that. At the plate he hit .267/.370/.424 for the Mustangs. His approach is advanced, he walked 27 times with 32 strikeouts in 209 total plate appearances. There’s also some pop in the reserves waiting to come out compared to what he showed in 2017, though it may be a few years down the road before it starts to show up. The Goodyear Reds saw a majority of the time at shortstop go to Miguel Hernandez. But, he began his season with the Dominican Summer League Rojos where he played in 37 games. The 18-year-old hit .285/.337/.397 in 167 plate appearances there before being promoted. With the AZL Reds he hit .314/.338/.407 in another 145 plate appearances. He made a lot of contact with just 42 strikeouts in 312 total trips to the plate. But that also came with a lack of walks, drawing just 15 of them on the season. Defensively he showed well for an 18-year-old, posting a .951 fielding percentage between the two stops. Scouts think he’s got a lot of potential in the field and there’s room for him to grow offensively, too. In June the Reds made their final big splash on the international market. The team paid $10M in total to sign Cuban shortstop Jose Garcia. Half of that went to Garcia and the other half to Major League Baseball as a penalty. He never got a chance to step onto the field during the year, but participated in the instructional league with the Reds in the Dominican Republic at their academy. Scouts seem a bit split on whether he can remain at shortstop in the long run, or if he will slide to center or second base. The Reds believe he can play short, though, and they’ll give him the opportunity to show it. Offensively is where there are less questions. He’s shown a good approach as an amateur, has good bat speed and shows some power potential. Calten Daal missed all of the 2017 season after only playing in 40 games in Double-A in the 2016 season. A shoulder injury has kept him off of the field, but when he’s been healthy, he’s shown potential to be a strong defender. At the plate he’s been more of a good average, high contact rate kind of hitter. He’ll be 24 this season, and injuries have cost him plenty of developmental time, but he’s someone we should see at some point in the first half of 2018. Shortstop has a problem at the top, but it’s got a lot of potential at the lower levels. In the immediate future the Reds need to hope that Jose Peraza is more like the 2016 version than the 2017 version because you have to go to Billings to find a shortstop in the organization who OPS’d over .600 last season. But, between Jose Garcia, Jeter Downs, and Miguel Hernandez there is a whole lot of upside. Garcia and Downs should see time in full-season ball during 2018, but they are both still several years away. There’s not a Top 10 prospect in the bunch, but there are two Top 15 prospects and three Top 25 guys. They all have a lot to prove, though. The guys from the full season leagues are probably all better hitters than they showed in 2017, but they all hit quite poorly. Overall I’ll give the position a C+, but with upside. Am looking forward to watching Downs and Garcia. Hopefully both are top 100 overall prospects a year from now. What’s the draft opinion on Luke Heimlich? He posted an ERA of .76 last year and is clearly one of the best college pitchers available for the draft. Is he so volatile that he can’t be mentioned in draft conversation, or is he not worthy of being in th top 30? I wouldn’t mind seeing the Reds pick him at #5.
yes, at 17 years of age. Not sure if you can consider him as a late round pick. It is disgusting what he did, but if he has paid his debt to society, should he be given a 2nd chance. He didn’t make Fangraphs list. Obviously the Reds are going to have to look outside the organization to fulfill their SS of the future (I, like most people, see Peraza as a miss). Philadelphia has Crawford/Kingery as their future middle infield. That leaves Caesar Hernandez as a trade piece which I think the Reds should jump on. BWAR has him at 3.3 and 3.1 the last two seasons at 2b but he is a plus defender who can easily manage the switch to SS. Signed through 2020 he will demand some real prospects though and not some fodder like most Reds fans think. If Senzel is the CF of the future, Winker and Schebler as the corner outfielders (with Duvall backing up both corner infield and corner outfield spots), an infield of Suarez, Hernandez, Votto and whomever lands the 2b spot (Gennett, Blandino, Long, etc.) and Barnhart at C that is pretty nice for the rebuild. With Peraza, Duvall, Hamilton and Dez on the bench, that strikes me as a legitimate playoff caliber lineup. Don’t really matter what fans think. Peraza, a former top 30 prospect, is going to get every chance to prove himself and has a very long leash. Reds coulda kept cozart at that price or vinji or could have atleast signed a back up but did none of those things bc they are fully committed to peraza. I’m a believer. He’s got a ton of mlb experience and is super young still. If u give up on every 23 year old that hasn’t panned out yet- that’s a lot of future all stars to give up on. I like Hernandez as well and would’ve targeted him in trade. My thought was to move him to CF. That’s a lot of assumptions for one post. Peraza is 23, and he’s already a bust? He’s the same age as Crawford and Kingery (they are literally 1 day apart in age), who have less than 100 MLB plate appearances between them, and somehow they are the future for the Phillies. I’m not buying any of it. Both teams are still discovering what they’ve got. The Phillies have no reason to trade Caesar H right now. He’s one of their best players. I don’t know much about the Phillies, but you don’t trade away you’re best players for prospects when you’re trying to win (which it seems like they are trying to do this year — at least as much as the Reds). Maybe he’s available later in the year if Crawford and Kingery are killing it. Senzel is not the CF of the future for the Reds. That’s a pipe dream that is unlikely to happen. But I guess if we’re dreaming we might as well make Iglesias and Castillo double barrel aces at the top of the staff with free agent signee Arrieta a close #3 starter. I never said or implied JP was a bust. I like him. He has 3 glaring weaknesses right now. Defense, plate discipline and an awful I so. It’s incredibly tough to work on one of those things, especially all three and against MLB pitchers. JP clearly wasn’t dominating the upper minors and frankly that is exactly where he should be in 2018. Of course Crawford, Kingery (thought of as much higher prospect quality than JP) will have to prove their up to snuff. I figure the trade deadline would be the logical timing (if not next offseason) for a trade to go down. I just hope the Reds FO isn’t asleep at the wheel if and when that happens. Senzel center is already being discussed in earnest. Plenty of middle infielders have maid such a move. That may not be such a pipedream as you imply. Jose Peraza will hit 280.. Obp 320 and steal 30 base this year and be a average fielding SS. Write it down. I think he needs to get his OBP up to 350. I’d like to see that as well but I don’t think it will happen next year. Where does Daal end up? I think he may be pushed out. I have always liked him but I think AAA would be aggressive for him and he is quickly being pushed by all of these other light bat, good glove SS. I’m a believer in Daal, but the skinny dude needs muscle. Like Billy, he needs to be shown what the inside of a weight room looks like. I’ll be interested to see where Trahan and Rodgriquez are placed by the Reds. There bats would indicate repeating their current levels, but the Reds have a need at AAA. Also, it will be interesting to see how Downs and Garcia are used as I anticipate both will begin the year at Dayton. If Gosselin isn’t on the bench, he’s an option. Darnell Sweeney can play SS as well. I’d also guess early on we may see Senzel get an occasional game at SS just to see how he fares there. If Gosselin does not pan out as backup he will be at AAA and we will pick up a SS at the end of Spring training. Never draft for current big league need. A HS SS is at least 3-4 years away in a best case scenario. Turang might be worth a pick that high, some of the scouts like Eierman (sp?) from college and think he might stick at SS, but there doesn’t seem to be a slam dunk pick. I agree duke but If u get first pick from the whole hs ss class or first pick of best college arm- then I like the probability of those guys panning out at an all star level over a guy at a different position/age. Redrafting I still take Greene over wright due to Greene’s ceiling but wright will be very good, as will puk. Lewis/Rodgers/Gordon/Correa- nice crop hs short stops. Which is the depressing paragraph? No one in full season ball OPS’ing over .600? Yeah….I guess that IS pretty depressing. Do not think the Reads want to have someone compete with Jose at this time. But looks like a nice player. Someone does still have to play SS at AAA, even if they’re not competing for the MLB gig. In fact, they probably need a starter and a backup, unless they plan to have Daal return in AAA and/or plan for Trahan to move up after doing nothing with the bat last year. Not sure Eduardo Nunez would take a minor league deal. Topical post today given that Matt Reynolds was picked up by the Nationals. I’m assuming the Reds had dibs but passed. I’m thinking the Reds feel they can pick up a better SS at the end of spring training when roster crunches present them with more options. The Mets had 10 days to determine what they would do with Reynolds from time he was designated. The first 7 days the team can try to trade him to any interested parties and try to get some type of return on the player. If no trade can be worked out, then about day 8 they can put him on waivers and teams have about 24-48 hours to make a claim. Reds were probably waiting to see if he hit the waiver wire, but weren’t so inclined as to offer up a lower prospect to trade for him. That shows that getting a backup SS at this time is a very low priority for the front office. 6 weeks still to go to find one. I know that clearly the Reds brass doesn’t think that Suarez can be a shortstop any more but I’m kind of confused by that whole scenario. With his incredible leap forward defensively at third I would think that would translate somewhat to SS. You could then move Senzel to third Suarez at short and Peraza to CF. Rather than trying to move Senzel to center. Doesn’t that seem like an easier plan than moving Senzel to CF or any OF position really. It also doesn’t force another 2B player into the mix if you add Senzel to the current group (Scooter, Herrera, Long, Blandino). It makes no sense to start Senzel’s clock, but I think he will be at 2nd. Unless Herrera surprises. Until July, or longer we have Scooter and Herrera for 2nd and bench. I don’t see why the Reds don’t just move Suarez to SS, let Senzel play 3B and then move Peraza to CF. Seems like a better move than trying to get Senzel to play 2B and OF. I know that Suarez defense will be a bit of a step back at SS than it is at 3B but I think with the huge strides he made last season a lot of that would translate. Plus you don’t add another player in the already crowded mix at 2B (Sooter, Long, Dilson and Blandino). might not be table to. I also think the Reds still are in love with Jose. On Opening Day, Suarez will man 3B and Peraza will man SS. Senzel will start in AAA or AA. We may see these guys rotate around a bit in Spring Training and if that happens, then we’ll know that the brass is considering rotating people around. Otherwise, we’ll see a Trading Deadline deal – or sooner if Senzel forces the issue. I doubt we see this issue next Spring. The number one rule of drafting in baseball is, take the best player available. However, as we have seen with Doug’s excellent offseason prospect coverage, you really should group players when ranking them. For instance, the Reds have a clear 1 and 2. But the 3 to 5 could realistically be ranked in any order. After that, 6 thru 12 could also be ranked in any order without much debate. So when drafting, I really think organizational need should come into play. And this ties in to Doug’s State of the System. So let’s take a look in regards to the draft. First Base- The minors are a barren waste land, but Votto makes drafting a first baseman high pointless. Catcher- Barnhart is locked in for a few years. Tyler Stephenson had a promising year and will only be in A+ ball. Plus, Okey has a lot invested in him and he is at the same level. If a player blows you away there, then maybe, but it wouldn’t be high. Second Base- At the moment, our top prospect maybe heading there. Then you have Long in AA ball. Herrera and Blandino also could come into play. Downs could move here if needed, as well as Miguel Hernandez. For this reason, I would not pick Madrigal if I thought he were a second baseman. SS- The organization believes in Peraza. And Doug’s article fills in the rest. There doesn’t seem to be a homerun in the system yet, but there could be a few. So, like catcher, I would really need to be blown away by a prospect in the draft. Third Base- Suarez and Senzel. Senzel and Suarez. But after that, the system is less than inspiring. Garcia seems like a good option to move here if his bat is as advertised. Downs is also possible. The system could use a power hitting third baseman. CF- Siri, Trammell, Fairchild, Friedl, Sugilio, Gordon. This is deep, but not at the upper levels. But that is okay since Hamilton is still here this year and next. Again, I need a really elite talent if I were drafting a CFer. Corner OF- Winker, Duvall, and Schebler are all available for the next 4 to 6 years. In the minors though, not much to like. Ervin seems like a light bat for the position. Aquino has everything but contact going for him. If Trammell has to move, he should fill out LF just fine. While the majors have a bounty, the minors have a famine. This system really needs a power hitting corner bat. Starting Pitching- The system is quite strong here. The Reds will hopefully have health this year and have a full rotation. Stephenson, Garrett, Romano, and Mahle will all be fighting for a big league gig. Then there’s a whole host of guys in the upper minors. In the lower minors, there’s top prospects Vlad in AA, Santillan in A+, and Greene in A. But lets face it you can never have enough pitching, and the Reds have a total lack of lefties in the organization. So, I think the Reds need either a power hitting corner bat or another elite arm, preferably a lefty. So, for me, it comes down to Gorman, Liberatore, and Hankins. Rolison, Greyson Jenista, and Griffin Conine are my darkhorses. Logan Gilbert’s blurb on Fangraphs reminded me of Tyler Mahle. And that’s a good thing. If he can show a consistently good slider, then I agree that he would come into play. As my opening stated (and I failed to tie in at the end), these guys are going to be tightly grouped within tiers. It really comes down to preference inside each tier. Right now Singer is the guy, after that, I think the next 10 guys or so will be pretty even. It comes down to what the organization needs and preference. I would prefer a Senzel level hitter who doesn’t play a premium position or a lefty pitcher. But anybody in that group of ten would be a good choice. CF or Corner OF–Greyson Jenista from Wichita St. is a 6′ 4″ 240 lb. 1B that also plays CF. 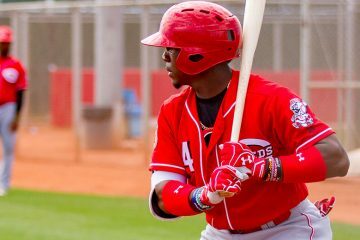 I think Jenista may be the most intriguing bat in the 2018 draft, then Madrigal. Nolan Gorman, the high school 3B may be gone at #5. I’ve read a lot of good things about him. Speaking of Wichita St. and 3B, they have a 3B in Alec Bohm that is a pre-season college All-American. He was an all-star in the Cape Cod League and finished 2nd in batting and 2nd in RBI’s. Coincidentally, Jenista was the MVP of the Cape Cod League. The 2 college pitchers, Singer (RH) of UF and McClanahan (LH) of USF, if either are there at #5 could be a steal. The high school pitchers, Hankins, Liberatore, or Rocker would all be nice to pair with Hunter Greene. FL is always a scout’s dream assignment. But it certainly would be sweet to be a scout on the circuit in the State of GA to go watch Hankins, Rocker, and Will Banfield and Joey Bart both C’s. Or in the State of AZ with Gorman and Liberatore. But it all hinges on what the Tigers, Giants, Phillies and White Sox do at #1 through #4. Tigers= pitching more than likely. Giants= pitching more than likely. Reds= ????????? An advanced bat ! Madrigal is enticing. But Jenista may be the best fit for the Reds. A big, big shout out to the Phillies draft team. Thank you for the 2016 draft. 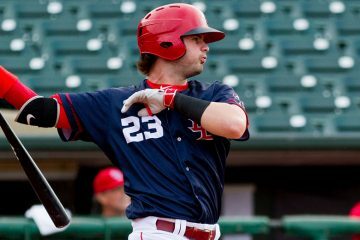 The Phillies took high school CF Mickey Moniac #1 overall and enabled the Reds to select 3B Nick Senzel 2nd overall. Lets all hope the Phillies draft team is in similar gifting mode in 2018 and don’t take the Reds desired pick at #3 when the Phillies pick. The reason Madrigal plays second base is the best SS in College Baseball Cadyn Grenier. He had a below average freshman year at the plate but had a nice year last year. His glove is very good, arm is strong and he makes all the plays. Read in to this as you will. On the recent Caravan tour, Reds manager Bryan Price was answering a question on the Senzel and Suarez at 3B issue, he said if Suarez was the one moved he could be moved to SS, and then there was a long 3-4 second pause, and then Price said, or to some other position. He didn’t say 2B, or a corner OF spot specifically, but that could be included in “some other position.” But the omission of 2B specifically by name struck a chord in me that made me go hmmmm. I thought that was a little bit revealing. With Senzel, he said that they were going to try and get Senzel some time at 2B and the outfield in the spring and I am assuming AAA also. If Peraza struggles at the plate in the spring and April, or is injured early, plan B may very well be to call up Senzel and move Suarez to SS. That may well explain the lack of a backup SS on the 40-man roster. That isn’t something I could entirely agree with. Suarez and Gennett up the middle defensively is light years away from the great D days of Phillips and Cozart. I don’t find that reassuring at all and the pitchers probably do not either. Here’s an observation about the Reds decision makers and the draft. They don’t care about the change-up when evaluating. Stephenson, Garrett, Travieso, and Lorenzen had no change-up when drafted. They all had an above average breaking ball or reasonable potential for one (Garrett). So, if a guy has a good change-up and a fringey breaking ball, I would count the Reds out. They are worried about the radar gun. They figure they can teach the off speed stuff. If they have the power stuff and also something off speed that is just a bonus. Wonder if Luis Gonzalez might again be considered at shortstop this year. He pretty much hit himself out of the discussion in ’15 and ’16. He had a serious ankle fracture at the end of ’15 that carried over to the next year. So last year he was supposed to work as an infield utility guy. By the time he left for Daytona he was outplaying Vargas then went on to replace Senzel at third and in line-up. His .283 combined batting average and power numbers were the best of his career. That’s a great point MK; not too long ago, he was a mid-level prospect. He also never passes up the opportunity to discuss the current state of the Reds and says it’s comforting knowing that his family members aren’t the only people who struggle through watching the lack of on-field success the Reds have been putting out the past few years. Tammy says that one of the most identifiable traits among Reds fans is the high expectations fans have for the team every year. No matter the game, Reds fans expect pitchers not to walk batters or ever miss the strike zone, Tammy says. Thomas says the Reds and their fans expect the players to do everything in their power to try to win every single game. Compared to other teams, Tammy admits that Reds fans, who have seen their team win five World Series titles and countless pennants, are relatively spoiled when it comes to their rich history.